Don't tell me you have never seen it before? How about the second one, "Tesla's longitudinal electricity" which is basically a practical lab and field test of the longitudinal waves, which supplements the theoretical stuff from the first one. As far as I am concerned they are timeless classics and guys from Borderland Sciences were on the forefront of things 20 years ago. Watching these videos and reading some of the notes should be mandatory for everyone wanting to learn about transverse and longitudinal waves. Yes, I've seen both. I bought the VCR tapes from Borderlands around the time when Peter came out with Free Energy Secrets of Cold Electricity. 7-8 years ago or so? I have recommended them ever since. Those films are classics. Both of them were produced by Borderland Labs. Eric Dollard, Tom Brown and I were all present for both films. I did a number of the explanation sequences in the first film, but stayed behind the camera on the second film. We actually produced three other films. 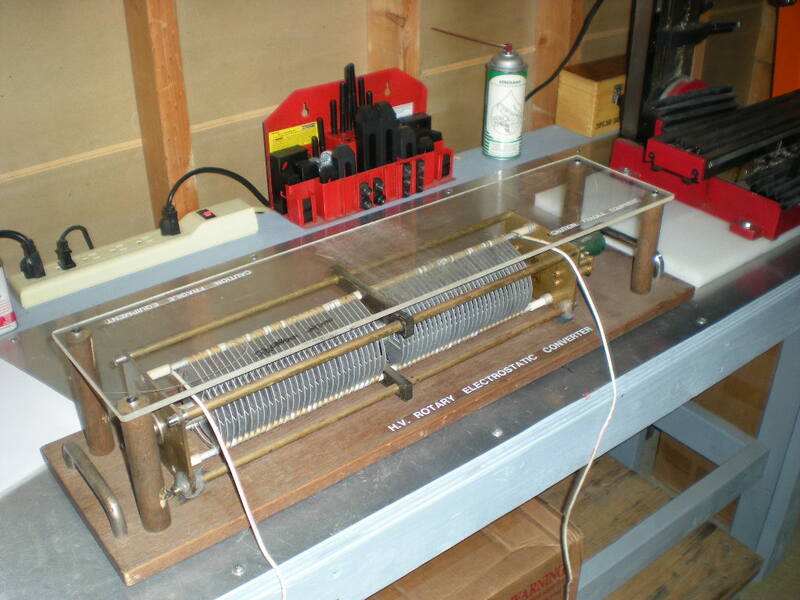 The very first one was titled "Free Energy Research" where we show an amazing array of experimental test set-ups, including my Parametric Transformer generator operating at 120% efficiency, and a variation of Bruce DePalma's N-Machine, producing AC with two brushes on the shaft. The other two films were never released for sale, but captured some of the most astonishing demonstrations I have ever seen. I had access to the video camera, so I was the cameraman on all the films. One of the events that was filmed was an "open house" where we show many of the other local engineers and physicists in the Santa Barbara area some of Eric's demonstrations. That meeting included Eric Dollard, Bruce DePalma, Tom Brown, Myself, Ed Delvers, Mike Knox, Roger Modjeski, Geoff Cook, and others. When there are that many geniuses in the room, the conversation gets very interesting. The highlight of the afternoon was the demonstration of Eric's "flame speaker" were we played Bach Concertos from the RF discharge of one of his small Tesla Coils. The high fidelity music actually came from the RF spark. No physical speaker mechanisms we involved. When the music was off, the RF discharge made a slight hissing sound. But this was quickly overpowered by the extremely high fidelity music that filled the room when the RF signal was modulated by the audio. Eric's knowledge of Tesla and Radio systems was simply unsurpassed!! All of the equipment demonstrated that day was built by Eric with support from Borderland Labs. As for the current where-abouts of Eric Dollard, I do not know. I have not seen him since 1992. He has done a few speaking engagements at the San Fransisco Tesla Society in the last few years, so I know he is out there somewhere. Thanks for asking. It's fun to reminisce about the "good ol' days". Thanks Peter for this trip down the memory lane, the rest of us who were not there can only imagine how it was being part of it all. So the singing Tesla coil was Eric's original idea then, because I have seen some YouTube videos recently of someone doing the same thing, though that person taped their performance in 2007 not 1988. What about those two other unreleased films, who has the rights to them now and would they consider releasing them into public domain so the World can see them? Todays "singing Tesla coils" don't use AM modulated RF but rather PWM modulated fixed frequency. In that regard Dollard's coil is significantly different. I have a copy of Free Energy Research from 1987 and a few other classics from that vintage. The other films of Eric's work are lost in the Borderlands archive somewhere. I filmed a series of tests at John Bedini's shop in 1986, with engineer Roger Modjeski. I also have a complete set of the speakers presentations at the Borderlands Conference in the summer of 1990. Most notably, the presentation of Bruce DePalma. Just another note about the two films of Eric's work. Those films were "one-take wonders". What you see are a series of "first takes" with no editing. We didn't have any video editing capability back then. We just shot the film, and sold copies. The credits were generated by the camera. Also, there was no script. We ad-libbed everything. At some point, I may try to make these other films available. Right now, its not a priority. Last edited by Peter Lindemann; 02-05-2008 at 06:34 AM. I think that's what would make these movies even more interesting - the fact that they were not scripted and all shot in first take. Maybe someday in the future you could find time to make them available to us...or let someone else digitize them? Then again I presume you would put them into Public Domain, which might not be your intent, please forgive me for that. Would that make Eric's coil more interesting or just simply different than what's done today (sorry I did not look deeper into today's singing coils)? Sound-wise PWM modulated Tesla coils should sound better, have more precise scale reproduction and wouldn't exhibit any hissing when no signal is present (since it would be turned on). Simply said one has much tighter control over it's sound parameters. I heard only PWM modulated Tesla coils first-handedly so I cannot rightly compare it's sound quality to Dollard's RF AM modulated coil since I only heard latter on the low quality BSRF video. However, none of these coils are high fidelity devices or at least none that I heard. Peter might disagree on that one but he heard Dollard's coils in person and I didn't so I might be wrong. This thread reminded me- what happened to the parametric transformer generator concept? It was an interesting concept. Last edited by lighty; 02-06-2008 at 03:30 AM. First of all, I don't know if Eric's audio modulation was AM or PWM. He always drove his large Tesla Coils with vacuum triodes in a "push-pull" PWM mode. He certainly had the knowledge to do it either way. The RF carrier frequency was the resonant frequency of the coil, which usually fell just outside of the AM band, in this case just above 1.6mhz. You could easily pick up the music on a short-wave radio in the room, which we did, but the music sounded better coming directly from the flame. The fidelity of the sound above 5khz was as good as the finest tweeter speaker system ever made. The clarity was stunning. The hiss of the discharge was probably below 3 db. It wasn't much. There were no visible changes to the electronic flame when the music was made louder or softer. The flame was about two inches tall and about one inch wide at the top. We are definitely stretching the limits of my memory, here! You say you have seen a BSRF video of this! Where? To the best of my knowledge, this film was never released. Last edited by Peter Lindemann; 02-06-2008 at 04:41 PM. Dollard himself states that it is an AM modulated TC. I'm talking about coil he used to burn various forms in pieces of wood. You probably remember what I'm talking about. AFAIK- you're correct. That film was never published publicly. just found some new video of Eric Dollard talking about Tesla Longitudinal wave Energy SBARC Ham Radio with Chris Carson. Hi, Thanks for that link, I will check it out! Also, I believe that Eric Dollard is giving a presentation in early November (the 8th i think) at the San Francisco Tesla Society.. He is still out there and kicking..! I believe they've been put up on google videos. I know exactly what he is talking about in #6 when he gave an anecdote of what happens when large longitudinal pulses are produced in a manufacturing environment. This is a major application for test and measurement instruments, to capture and analyze transients that sometimes accidentally cause these longitudinal waves (...using the "Pre-Trigger" feature to store the event, which allows the continual storing of all signal data, but only actually writes it to disk when the trigger occurs; which allows showing what led-up to the trigger event, which is the real data of interest to troubleshooters). Computers and heavily shielded controllers 100 meters away on totally separate grounds can crash / reset, as well as the office's phone system even farther away. I've been on site training & helping Customers in steel, aluminum, and paper mills & other high-current conveyor lines set up their newly-purchased Data Acquisition equipment to troubleshoot these issues; and have seen it happen myself multiple times. It DOES commonly occur, especially with the older SCR drives... Despite the copper-tops whining about it being "impossible", lol. These days, Variable F drives are replacing the SCR's so it's less commonly seen. Every time it happened at different factories & mills that i know of (at least 8), SCR drives were involved. This is one of the reasons i first started studying these subjects, because i knew that conventional electrical theory was B-S . There is no way to explain these "transient" problems with conventional transverse wave EM theory: The totally separate grounds and proper shielding against EMF eliminates that from consideration... So what is left? It's a criminal shame this has been kept from us for over 100 years. And it is criminal what they have done to Mr. Dollard as well. BTW: He is completely correct about EMF causing cataracts. I had them very bad at age "42", and several other folks in electronics i know have them as well, at much too young an age. Instances of cataracts are up over 300% in the last 30 years. If you suspect you might have them, go to a microscope and look into the eyepiece. If you see a mass that looks like a hair ball, or an amoeba, reflected back, then you probably do. Modern surgery to replace the lens is a quick out-patient procedure these days. I've heard rumors of non-invasive means to cure them; but from what i was told before, it is "impossible" to restore the natural lenses, lol. You had better have insurance though: It is about $10,000 an eye. Maybe we should make G.E. or Verizon or AT&T pay, hey? What about naturapathic rememdies. I'm in the field, I can say that with increased antioxidants, you eye will get better. Keep in mind the body replaces every cell in 7 year cycles. Well, like i said i have heard it is possible. But the ophthalmologist said it definitely wasn't And last year when i took my father to have his done, that one said the same thing. The Lens of the eye is not living cellular tissue. When it becomes scratched (what cataracts are), that is supposed to be that (...like "a pair of glasses", was the analogy i was given at the time). Lol, but i did trust mainstream medicine A LOT more several years ago when i had my done, than i do now... so who knows. I do remember seeing that the Swiss company that claimed to be in business with Daniel Dingel last year, advertised that they had a cure for cataracts without surgery. But i also heard that company was scamming regarding Dingel's work and that site did not have his approval.... So again, who knows lol. 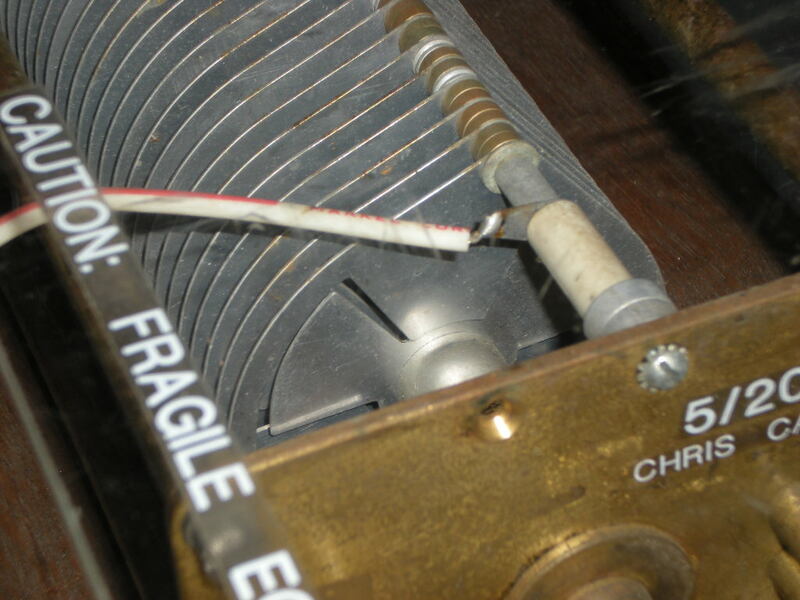 In Part 6 I noticed that Eric mentioned that Chris Carson created an electrostatic equivalent of the N-Machine, which consisted of a 1000pf variable capacitor that was spun by a 10,000 rpm motor. Does anyone have any further information on this? I think you would do good to look up Parametric excitation of a resonant system. Parametrics are very interesting indeed. Parametrics involve varying the parameters of a resonant system (in a pendulum, length or mass, LC - capacitance or inductance). Ideally the forcing rate of change should be 2x the resonant frequency of the system you want for stable opperation, though many bifurcations can be had. This is similar to Jim Murrays work albeit with capacitance. Last edited by Armagdn03; 11-07-2009 at 04:49 PM. After Chris died of aggressive Glioblastoma (cell phone induced) brain cancer, his wife donated most of his research and experimental models to friends and other institutions. When I was asked if there was anything I wanted, the only thing I asked for was the rotating variable capacitor generator model. I still have it, though I have not done anything with it yet. Eric's statement, that it is "an electrostatic equivalent" of the N-machine, is not the best way to describe it. It is more like the inverse, compliment of a variable reluctance generator. The machine has two sections where stator plates and rotor plates rotate in-between each other, varying the capacitance. 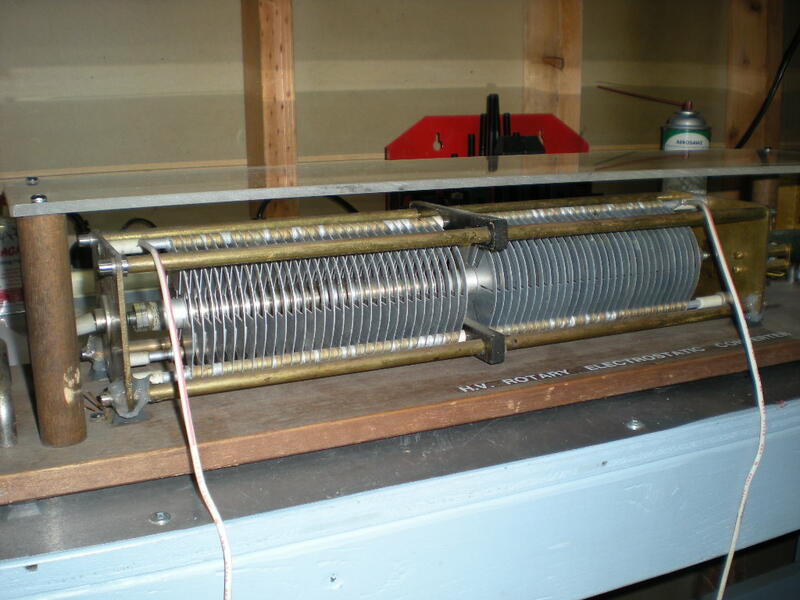 These two sections are 180* out of phase with each other, so when the rotor plates are connected to a source of 5,000 volts, and spun at 10,000 rpm, the two sections of the stator produce an AC signal between them. Drawing power from the machine produces no drag on the input motor. There are other ways to wire it, as well. Chris was a brilliant engineer and experimentalist. If I can find the machine in my garage, I'll post a few pictures of it. Last edited by Peter Lindemann; 11-07-2009 at 06:58 PM. I would be very interested to see Peter, as this is an experiment I have wanted to run for quite a while, but did not have the setup to do so. Thanks again. This also caught my eye, I have wondered for a bit what your take on parametrics are with respect to COP vs Efficiency. The standard definitions of COP with open system considerations don't quite apply, making parametrics an interesting and perhaps unique case. Last edited by Armagdn03; 11-07-2009 at 05:01 PM. OK, here it is. Chris built beautiful models. The first picture shows Chris's name for the machine. The second picture shows an oblique view of the whole machine. Total length of the machine is about 24 inches long, while the mounting base is about 30 inches long. The little green device at the far end is the DC drive motor used to rotate the plates. 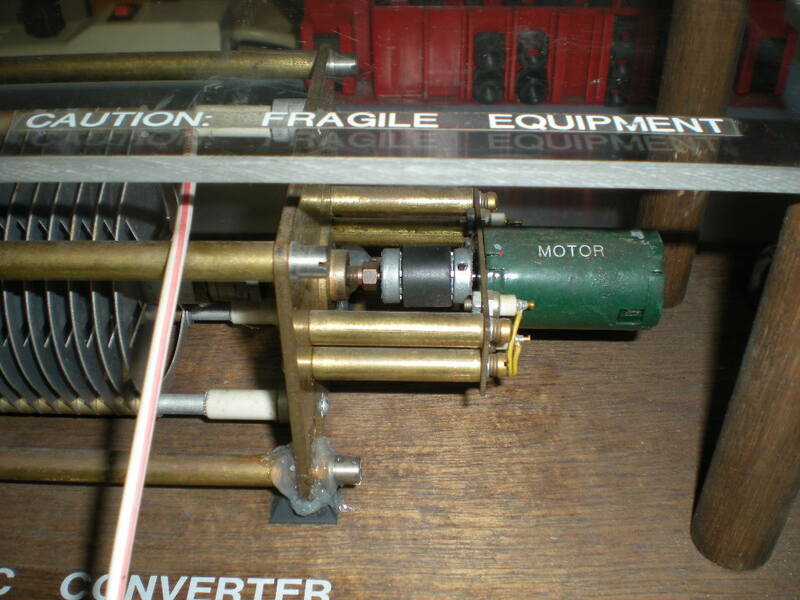 The third picture shows the motor drive unit. The motor is a DC brush type, with a permanent magnet field. It is 2.125 inches long and 1.25 inches in diameter. The fourth picture shows an end view when the rotor plates are in alignment with the stator plates. This is the position for highest capacitance in that section. The fifth picture shows an end view when the rotor plates are out of alignment with the stator plates. This is the position for lowest capacitance in that section. The sixth picture shows another, lower angle shot of the whole machine. It also shows how one section is out of phase with the other. 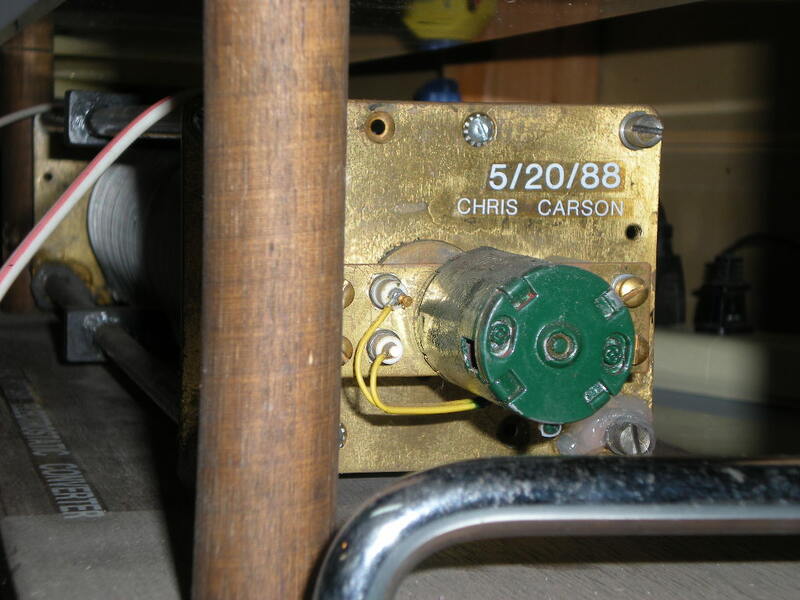 The last picture shows the end plate with Chris's name and the date the machine first ran, May 20, 1988. Last edited by Peter Lindemann; 11-08-2009 at 05:50 PM. Thank you for taking the time to post these pictures, What a fantastic looking demonstration model. Thank you Peter for taking the time to take pictures of the device. 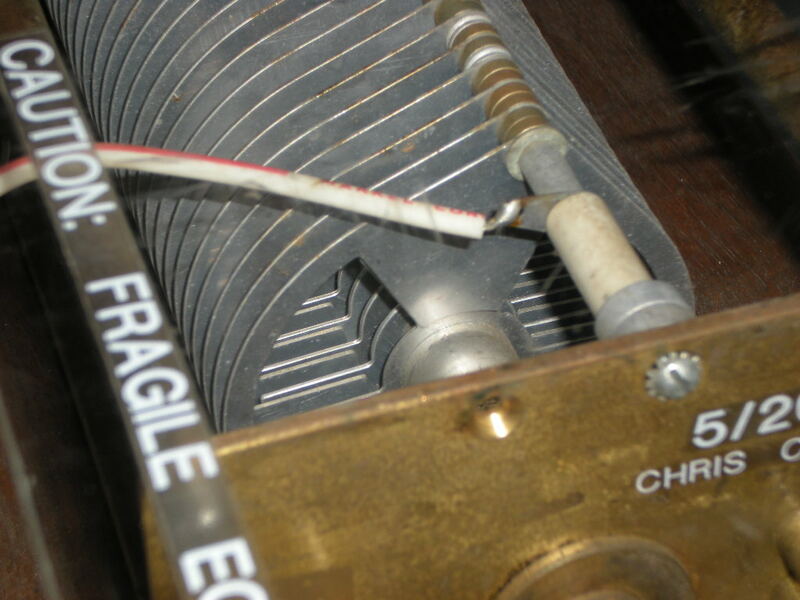 Was the air capacitor Chris used one which could spin freely or did he need to modify it? Or did he build the capacitor from scratch? 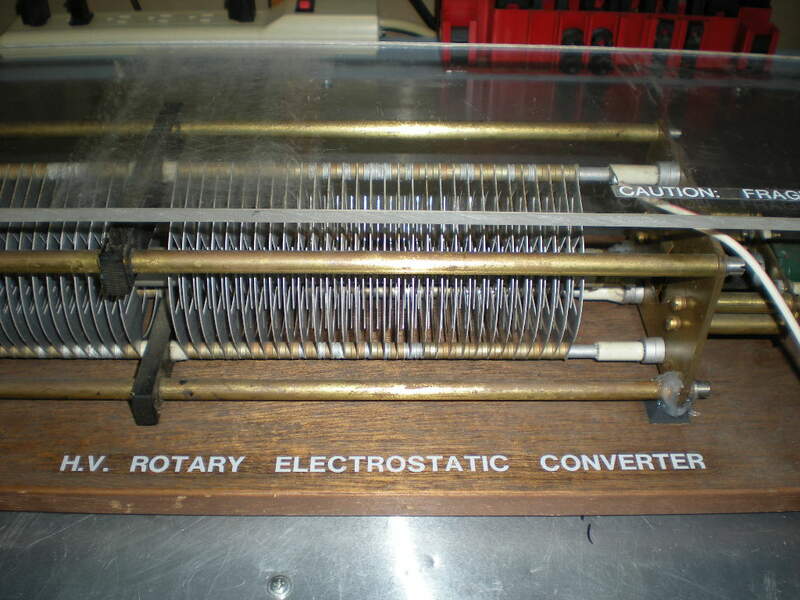 He started with a large, variable capacitor and modified it so it would spin. The modifications were not that easy.